Jeff Young founded Collingwood Turtle Watch last spring with a goal of creating awareness about all eight species now at risk. 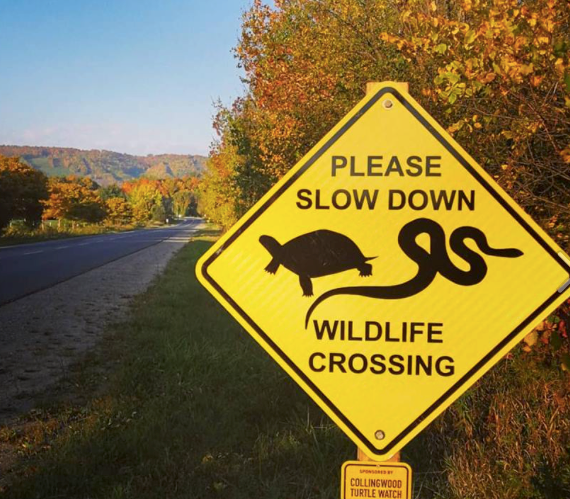 One of his current projects is putting up turtle crossing signs in some local turtle crossing areas. He put up his first sign this summer on Monterra Road facing west with a goal of a second facing east next spring. Each sign costs about $500 with $100 of it being a yearly renewal. To raise funds, he had magnets created for the back of a car with the slogan “I brake for turtles” https://www.instagram.com/p/BmcHx7pHg1K/?taken-by=collingwoodturtlewatch). They are similar to the cycling magnets used by a lot of people in the area. Along with the magnet sales, local enthusiasts and the Blue Mountain Watershed Trust have helped fund the program. Being run over is one of the biggest threats turtles face. Turtles are unfortunately not fleet of feet and can need help to cross the road safely. If you see a turtle on a road move it across in the direction it is heading. If you need advice, contact Jeff Young at (647) 580-7144. He also works with the Ontario Turtle Conservation Centre that helps injured turtles. He recommends downloading the Ontario Reptile and Amphibian Atlas App to report sightings. Each submission helps Ontario Nature gain important knowledge about turtles in the province. Pick up snapping turtles by holding the back of the shell with two hands. If you’re uneasy about picking up a turtle, use a car mat or some fabric and slide it across the road.